Hi Terri WOW if winter can bring this beautiful art work out of you. Then let it be winter. You're so right sometimes winter can be in us. Terri, your book is just amazing! I knew I would love it because of the aqua, but you've created a true work of art and I'm captivated! Congratulations on completing such a beautiful project. I am speechless Terri! This is thee most gorgeous book I have ever seen! 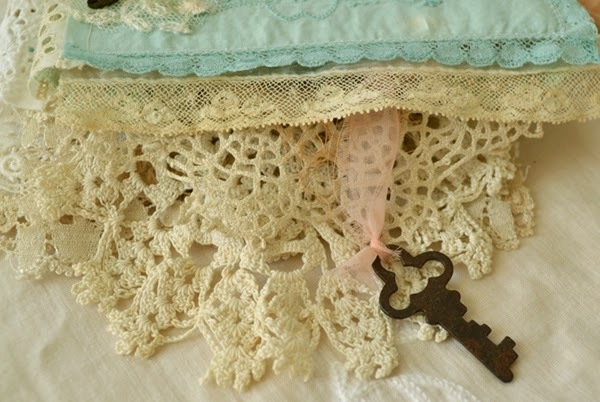 You have expressed yourself so beautifully with so many wonderful vintage details and personal pieces that mean so much to you, I hope it brings you comfort and healing and light and renewal. I cannot say how much I love it! this is really wonderful. A book full of romantic dreams. Thank you for sharing this great idea. Have a wonderful weekend. 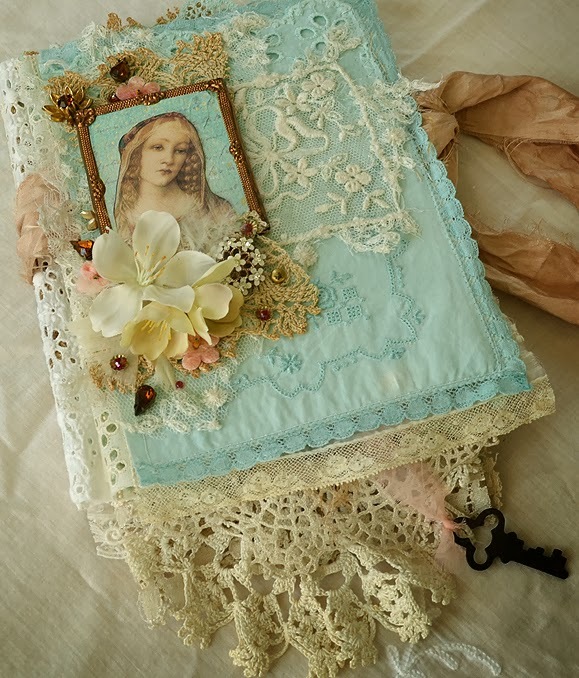 Your 'Renewal' fabric book is so beautifully created. 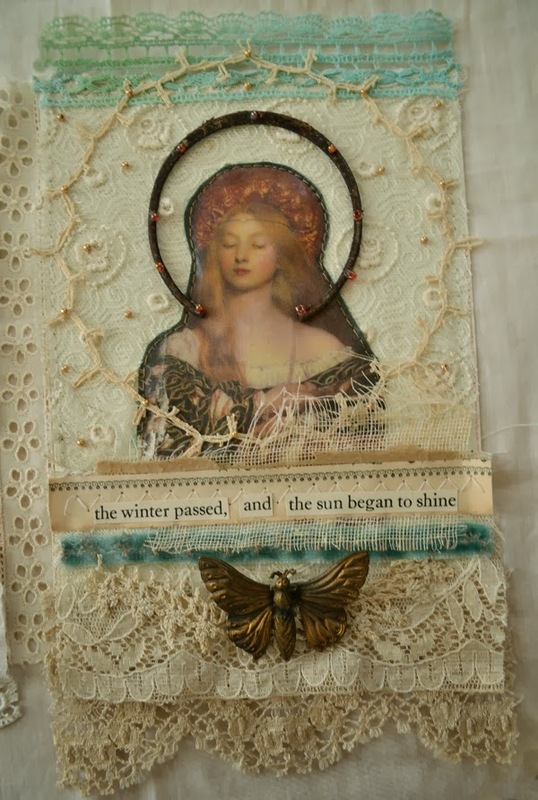 From the angelic image on the front cover to each and every embellished page - it is exquisite. 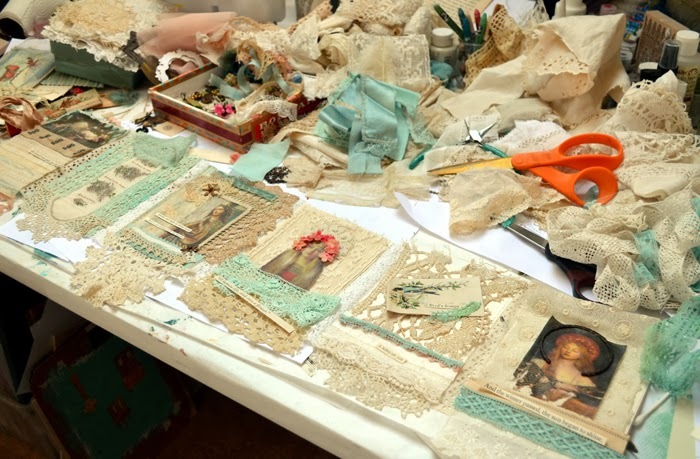 You have used so many lovely pieces of lace and sari silk - gorgeous colours too! Soooooooooo beautiful! LOVING all that lace!!! Your book is exquisite Terri! Your book is so pretty, I love the words. This is simply too, too gorgeous for words, Terri. Looking at the pictures is an almost sensuous experience. I want to reach out and stroke! So beautiful and contemplative. You've inspired me to start another mixed media journal! Terri, Terri! How inspiring and BEAUTIFUL!! 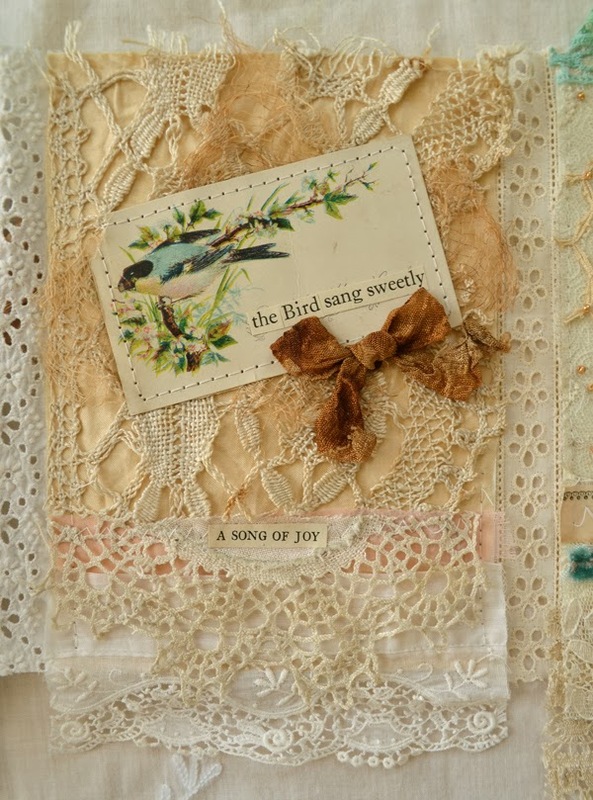 We have always been kindred souls in many ways - loving vintage textiles and especially with renewing and refreshing. I, too am on that path once again. Especially with a recent career disappointment I waited so long for (not the disappointment, but the outcome), but I know God has something more wonderful for me. This book is so absolutely lovely. Your dyed fabrics and ribbons are stunning, and the total composition of the piece is MOST elegant. Yes, the way you pulled off the transfer so that it wouldn't stick all the way was brilliant. All in all this is a splendid creation of your soul. I love it, beyond words - truly. Thank you for sharing this and inspiring me with something so pretty to look at. This takes my breath away. I sigh. I swoon. Thank you for this beautiful Sunday morning vision. you must be so pleased with how this turned out! This is a stunning piece of art. I love all of the elements that you used. 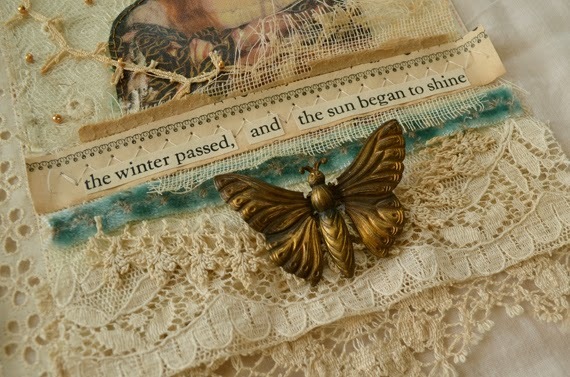 That antique hook and eye tape is one of my favorite pages, but I love them all!! Terri I think you have totally outdone yourself. This book is breathtaking and so full of beautiful thoughts-not to mention all the imagery, bits, and laces-wow!! 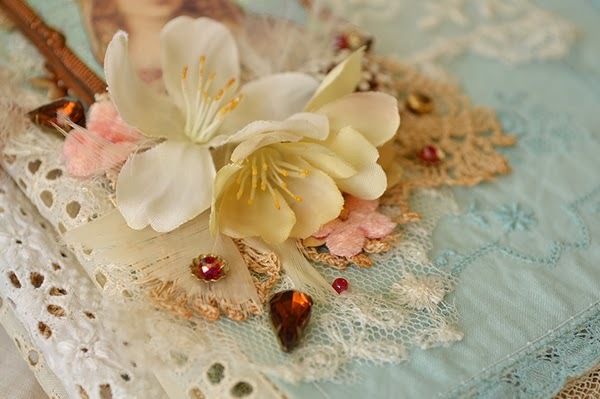 your book is stunning dear friend... in every way I love what you created,-all the laces, the images you used, and the colours of nature : ,both from soil,the trees -and the sea and sky . So beautiful together. I so agree that winter is also sometimes within ourselves -even in summertime, and your book will surely give joy ,comfort, healing and happy feelings -,also to a sad mind, if necessary .Just gorgeous, dear. This is absolutely beautiful Terri! The beautiful collage book and your heart which I feel through your lovely writing. This post has blessed me today! Wow, this is just stunning in both the design and the sentiments! 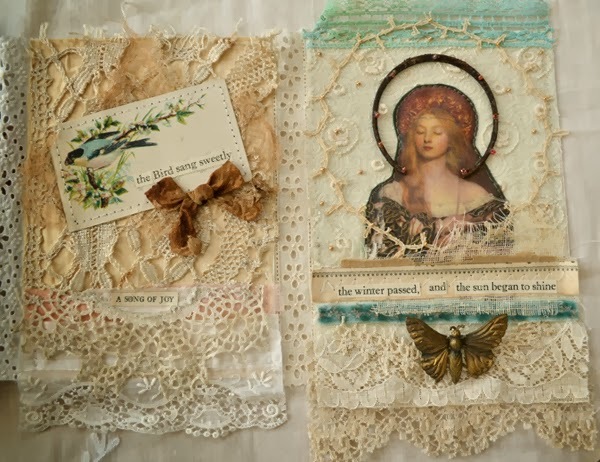 You have worked your magic yet again to create this gorgeous keepsake book. 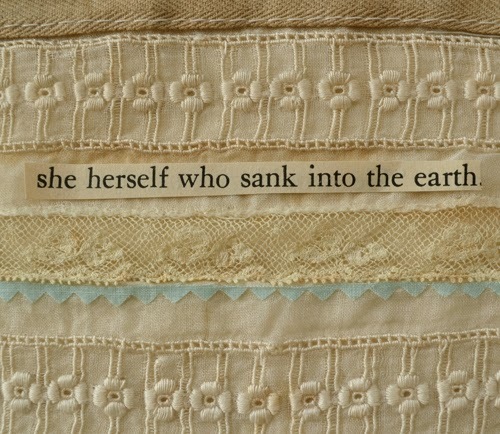 There is so much attention to detail and your choice of colours, textiles and texts are absolutely charming. You must be delighted with it. Thank you for sharing this darling lilttle treasure with us. It is so very beautiful, Terri. I bought the book by Traci Lyn Huskamp because of your incredible inspiration from it, and of course, it is all that you say. Your Fabric/Paper Book deserves a better name that that, the likes of which I cannot find the words. Heavenly. Terri this turned out so breathtaking! i love your artwork. I am so glad you shared the finished product it truly is beautiful. What a beautiful work of art, Terri! I love everything about it! You are so very talented! Absolutely completely and utterly beautiful. Really an amazing piece of work Terri. I'm sure it looks even more wonderful in 'real' life. 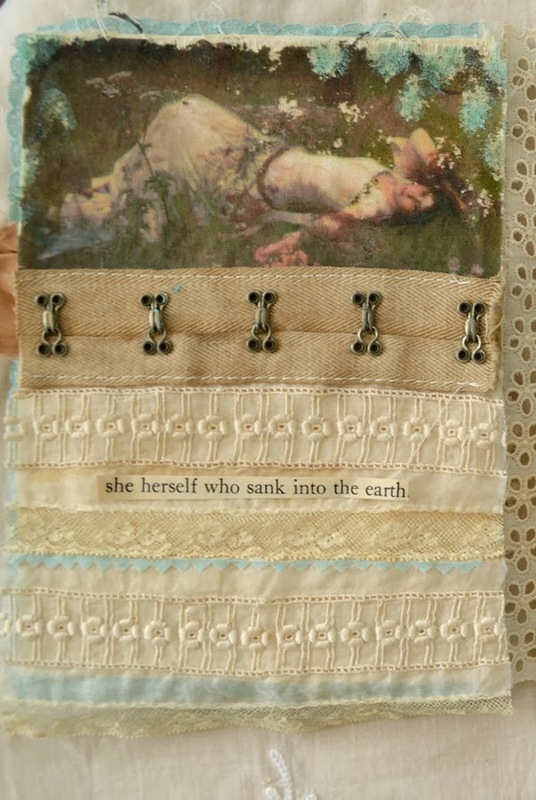 Oh Terri your final artwork on this fold out book is absolutely divine! I can feel the love coming from it all the way from here. 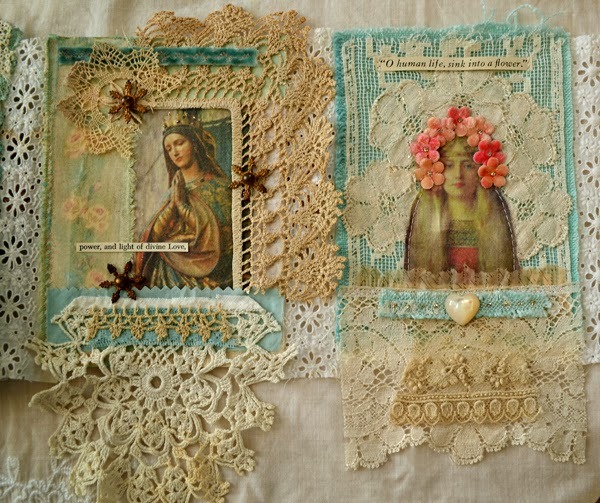 Love the images you have chosen and all the little embellishments which go to create such a work of art. Quite right about the long winter days! I am actually enjoying a gorgeous warm day as I read your post outside. The book is just heavenly good! 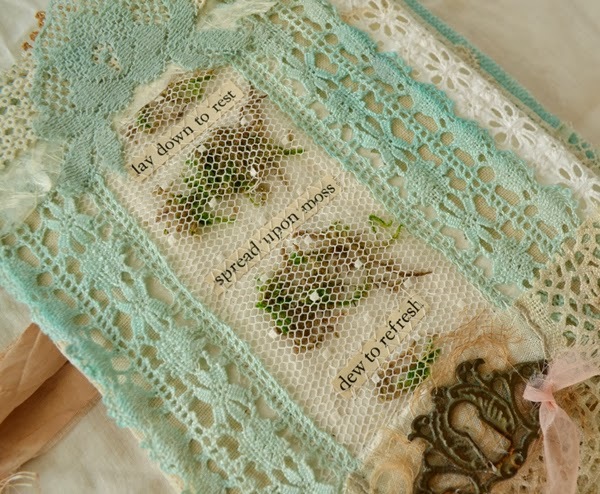 All the layers and stained fabrics and beautiful words make for one dreamy project. ohhhh terri.... no words to tell you how much I love this... breathtaking! 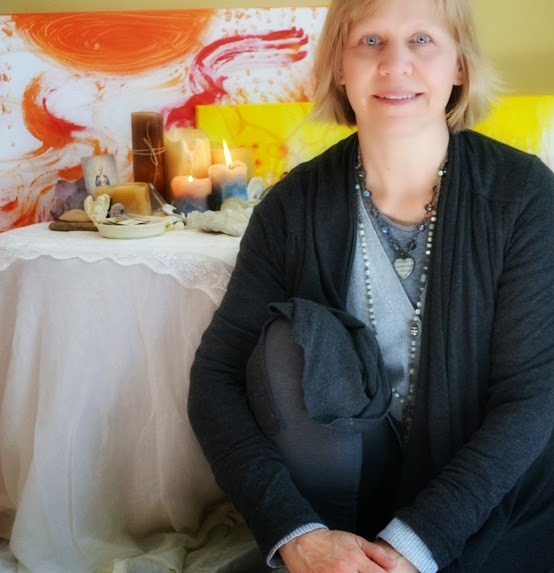 Gorgeous art..stunning Terri...very sacred and special..each word and thread and image and adornment is blissful and beautiful..and carries your magical touch! Such talent..your creations are filled with spirit..beauty and elegance!! A gorgeous book-your hard work and love of art shines through so brightly!